Quick Definition: The Laffer curve is a graphical representation of the relationship between the government tax rate and the amount of tax revenue it receives. The Laffer curve is a graph showing the relationship between a government’s overall tax rate and the amount of tax revenue it receives. It is often referred to by economists and politicians as evidence that actually having lower taxes can increase the government’s revenue. A key point to make about the Laffer curve is that it has no fixed or defined shape. Although the shape of the curve is generally presented as a semicircle, like the one below, there are many different interpretations of where the ‘peak’ of the curve is. The curve shows that the government collects no (or very little) revenue with a 0% tax rate, but also with a 100% rate. This is because as tax rates rise, people have fewer incentives to work since the government is taking a higher percentage of their earnings. An additional reason is the fact that people and businesses do more to avoid paying taxes by finding loopholes in the system. Another key characteristic of the curve is its peak. 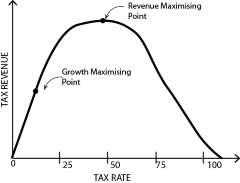 The peak of the curve is called the revenue maximising point. In other words it shows which tax rate the government should use in order to collect the highest amount of revenue. The revenue maximising point is interpreted differently among economists and politicians but most agree that it lies somewhere between the 20% and 50% tax rates. On the Laffer curve there is a growth maximising point. As the name suggests, this is the point on the curve that shows which tax rate achieves the highest rate of economic growth. There are again disagreements over where the growth maximising point lies, but it is generally accepted that it is lower than the revenue maximising point – most taxes are considered bad for the growth of a country’s economic output even if they do collect revenue. Economic growth – Economic growth is when a country’s production of goods and services increases over time. Economic growth is also accompanied with an increase in average incomes and a better quality of life and standard of living. Revenue –This is the money received by a firm when they sell a product. The calculation for total revenue is: price multiplied by quantity sold. Taxation – This is the money collected by governments from people’s earnings, wealth or spending.